How to get your money into Roth IRA even when IRS prohibits it? In my previous article on Simplifying saving for college, I talked about getting your money into Roth IRA since its one of the most flexible tax advantaged retirement vehicles. However, IRS has an income limit restriction. They will not let you contribute if your Modified Adjusted Gross Income (MAGI), married filing jointly, is greater than $196,000 (2017 number). Then, how do we do it? We take advantage of a tax loophole where conversions from other Retirement accounts to Roth IRA is possible. Let me tell you step-by-step as to how I do it. I use Vanguard heavily since the cost structure of Vanguard is pretty solid and they have extremely low expense ratio for most of their funds (I can get into more details of Vanguard in a different post). The trick is that I don’t have a Traditional IRA with loads of money in it. This is the bedrock of conversion methodology. This is because when you convert from one Retirement Account to another one like Roth IRA, it leads to a taxable event. If you have plenty of pretax money lying around in a Traditional IRA and if you convert it to Roth, it will lead to a big tax bill that year (Even if you contributed to Traditional IRA with post tax dollars, the growth/earnings portion will trigger a tax bill). Below are the right steps to achieve the most optimal results if you don’t have money lying around in an existing Traditional IRA. Open a Traditional IRA with Vanguard if you don’t have one. Contribute $5500 (the contribution limit in 2017). Buy whatever fund you desire. Open a Roth IRA with Vanguard if you don’t have one yet. Once the funds have settled into the Traditional IRA (takes a couple of days or so), ask Vanguard to convert the funds to Roth. The important point is to do it ASAP after the funds are available to be converted because you don’t want the money to grow before it reaches Roth; otherwise you will have to pay taxes on the growth. This technique is called “The Backdoor Roth”. I don’t know how long this loophole will last, hence make hay while the sun shines. 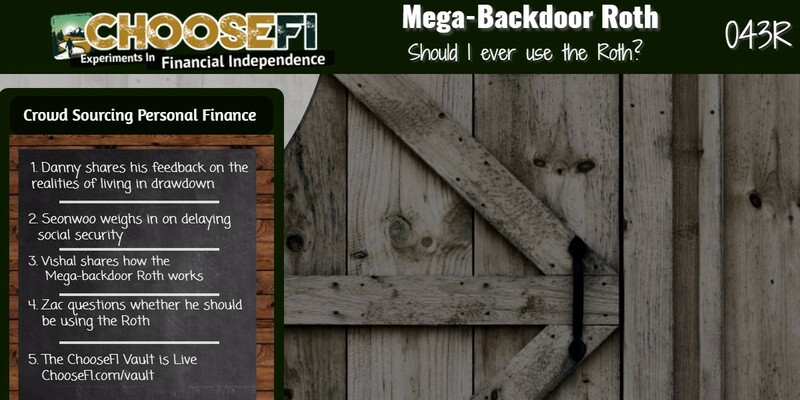 Of course, the best advice here is for people whose MAGI (married filing jointly) <$196,000, please open a Roth IRA right away and start contributing directly to Roth instead of using the Backdoor hack. IRS starts phasing out the benefits beyond the MAGI (married filing jointly) of $186000; hence you won’t get to contribute the full $5500 between $186,000 and $196,000. If your MAGI (married filing jointly) lands below $186,000, you get the full $5500 to contribute. Eventually, I will write another post where I will tell you another trick about contributing to Roth. Meanwhile, keep reading and start saving! Avoid big student loans if possible. They will hunt you till your grave if you don’t pay them back. It is highly irresponsible to not pay back your loans in the first place but unlike other loans which go away if you file for bankruptcy, student loans don’t. You can withdraw the principal (your after-tax contribution) anytime without any restrictions. First time home buy (a lifetime limit of $10,000) for the account holder, account holder’s children and grand children. You can withdraw the growth, penalty free (but not tax free unless you are older than 59 1/2) if it is for college. You will pay ordinary income taxes on the amount of growth you withdraw for college. I do NOT advise touching the growth for college though unless absolutely necessary. This exception withdrawal does not have to wait for the 5 year period as discussed in the previous bullet. The college fee and tuition can be paid for the account holder, account holder’s spouse, children, grand children, great grand children etc. The contributions are flexibly available and if you don’t touch the earnings, they grow tax free. Assets in Roth IRA are not used in calculating the Expected Family Contribution on the FAFSA (Financial Aid Form). If your income is low and you could potentially qualify for Financial Aid/Scholarships, the amount of contributions which you withdraw, even though it won’t be taxed again, is still considered untaxed income on FAFSA (Financial Aid Form) and reduces eligibility for next year’s financial aid. The strategy will be to withdraw the amount a couple of years ahead of time called Prior Prior Year- PPY (losing the opportunity of growth for two years in hopes to qualify for financial aid/scholarships). There are usually income limits for Roth IRA contributions. People like me in the high tech industry don’t qualify to contribute. However, there are some loopholes which you can use. I will not list them here. If you are interested, you can either ping me for a friendly chat or read up online. Use it as the secondary college fund. After tax money goes into the fund and grows tax free. Leave it intact for your child’s graduate school or college later or your own education at some point in time if you are thinking of going back to college. Withdraw the leftovers. You will pay ordinary income taxes on the earnings and will also pay 10% federal penalty tax on the earnings portion (a state penalty might also apply). Assets in 529 are used to determine EFC (Expected Family Contribution) on FAFSA and reduce Financial Aid Eligibility. Both contributions and earnings are available to pay for college without taxes or penalty. The withdrawal from 529 does not show up as income in that year for FAFSA purposes since the EFC has already taken care of including these assets in its determination, so no double counting. I know all of this can be a bit too much but I have excluded many unnecessary things which confuse the parents. I don’t hold myself to any liability claims for this advice. Please talk to your financial advisor before making any contributions/investments. This is just a friendly advice and not a certified financial advisor’s advice.